Home \ Our Blog \ Beauty Buzz \ Get Ready for Coachella: Here’s the Look to Rock! Get Ready for Coachella: Here’s the Look to Rock! This isn’t the prom! Don’t go for fancy up-dos and complicated braids. When it comes to your hair or makeup, think simple and natural. Braids top the list of easy-to-do and easy-to-stay. Whether you choose a traditional three section pony in the back or want a bangs braid only, the idea is to create something tight and easy that will last in whatever weather you have on festival day. Just choose your favorite style and accent with ribbons and bows. Beach waves look like summer fun. To achieve this popular style, apply some sea salt spray to damp hair, then gather sections and twist before using a flatiron every few inches down the strands. Repeat throughout your hair and allow your hair to cool completely before releasing the strands and showing off your straight-from-the-beach, summer look. For hot and sticky summer shows, it may be best to gather all your hair, get it off your neck, and pull it up in a tight bun. You can do a classic ballet bun by wetting your hair, gathering it in a tight pony at the top of your head, and smoothing with a pomade or gel. Give the pony a light hair spray and loosely twist it in a clockwise motion, gathering pieces as you go. Grip with three or four hair pins. Step one for any outdoor festival is an effective sunscreen. The sun can cause short-term damage to your skin, like sunburn. But it can also cause premature aging and even skin cancer. Use a broad-spectrum sunscreen with at least an SPF 15 and reapply as needed; water and sweat will wash it away. Don’t forget to use sunblock on your lips. And remember to hydrate. Water is good for your skin and your whole body. There are no mirrors in those porta potties, so you won’t be doing check-ups and touch-ups. Opt for very simple makeup. Use a tinted moisturizer or a light powdered foundation. For your eyes, choose water resistant liner and mascara. If you want a splash of color, use a colored liner or choose a long-lasting cream shadow. All your products should be able to stand up to sun and rain because when your event is outdoors you need to be prepared. 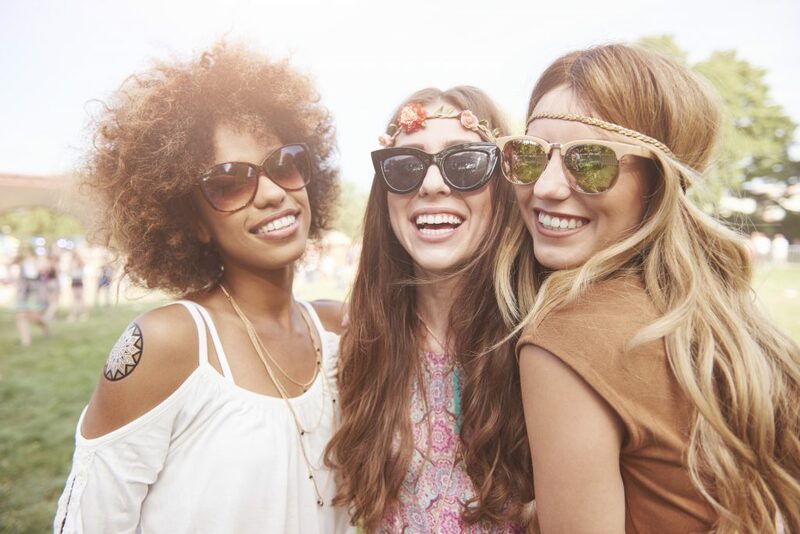 Do you have any tips on how to look great in festival season, whether it’s on the first or fiftieth selfie? Let us know. And if you have a knack for makeup, hair, and style, maybe it’s time to turn your talent into an actual career. Salon Success Academy offers Cosmetology training throughout the Inland Empire of California. Fill out the form and we’ll be in touch to schedule a school tour at one of our six campus locations.